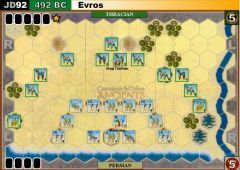 King Darius I of Persia sent an expedition against Athens in reprisal for the burning of Sardes in 498 BC during the failed Ionian Revolt. 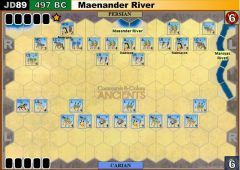 The Persian fleet under the joint command of Datis and Artaphernes landed near Marathon bay, which offered a perfect battleground for their troops. 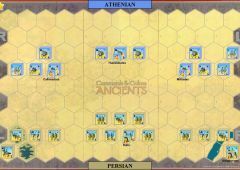 The Athenians marched out to face the enemy in the field, with 1000 allied soldiers from Plataea supplementing the Athenian force of 9000. 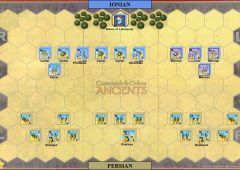 The Persians outnumbered the Greeks, but to counter the disparity, Callimachus extended the Greek line to match the enemy, thinning the center while keeping both wings at full strength. 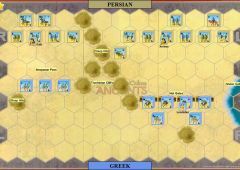 The Persian army, with its best troops in the center, was taken by surprise when the Athenians attacked. 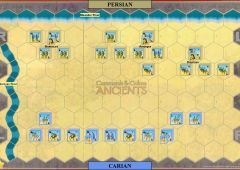 Historians suggest that the some of the Persian cavalry was in the process of embarking back onto the ships when the attack started. 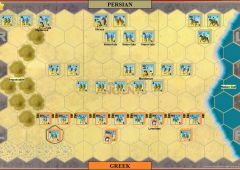 In the battle the Persian center got the best of the weak Greek center and broke through, but this success was more than countered by the defeat of their two wings. 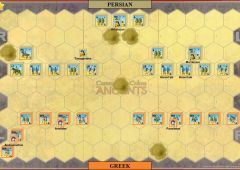 The victorious Athenians then swung inwards and the Persian force was routed back to their ships. 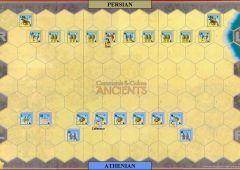 Concerned that the defeated Persians might still sail around to threaten Athens, Pheidippides ran the 26 miles back to Athens with news of the victory, running first Marathon race. Greece was safe, for now. Sea hexes and hills are impassable. 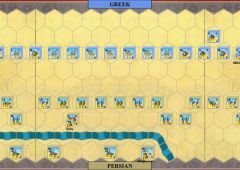 Yes I think it would have been better to either make the Athenian Centre Medium and the flanks heavy or simply give them more blocks on the flanks than in the Centre. 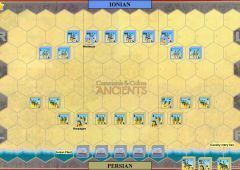 As for the Persians I would personally play them as auxilia but with bows instead of javelins. 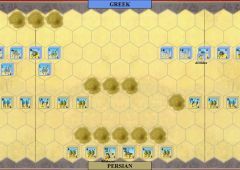 What is being simulated here is that the Greeks thinned their lines in the centre and had heavier flanks. 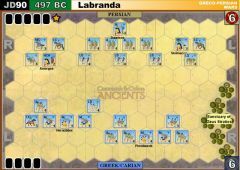 Perhaps a rule denying missile fire for the Auxillia units? 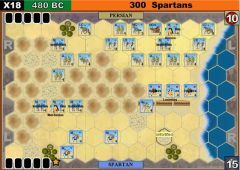 But then their is still the problem that the Greek centre can move more quickly despite being hoplites. 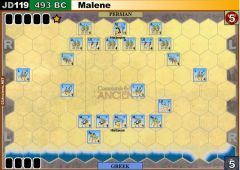 So the solution to that might be just to make all the auxillia units medium units with perhaps only 3 blocks each. Having said all that, I enjoyed this scenario as written. Don Clarkes scenario is good too. 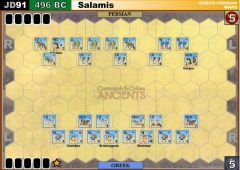 The Greeks had very little missile capability on this battle, didn't they? They wouldn't have had a centre full of javelineers as suggested in this scenario. 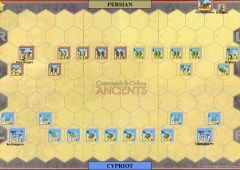 The Battle opened with the Greeks moving forward on the left flank while the Persians countered with ineffective Archery. 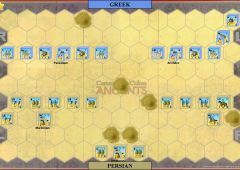 This was followed by a line command that allowed the Greeks to close and begin the destruction of the Persian's right flank. 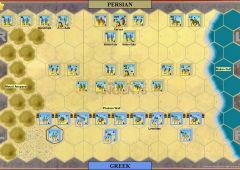 The Persian Counterattacked bringing their Auxiliaries to bear on the center with the advantage of a near by leader and continuing the tradition of ineffective fire now on the left. 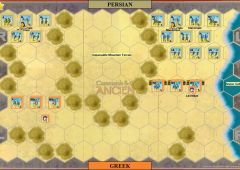 The Greeks continued the destruction of the Persian Left climbing to three banners and wheeling towards the center while the Persian used an Inspired leadership to move the Commanded Medium Infantry up to win their second banner and fire on the Greek right causing a slight retreat. 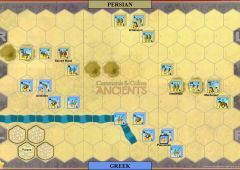 After a turn of mild maneuver by both sides, The Greeks finished their wheel to the center by attacking the commanded Persian Medium Infantry and killing both it and its leader. 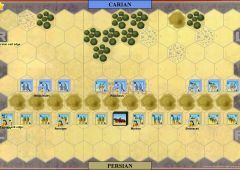 More maneuvering saw another Persian Banner, but left the Persians in desperate straits with a weakened center and no right flank. 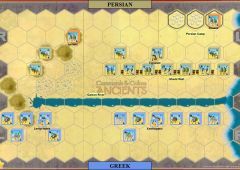 The Persians used "I am Spartacus" but only managed two blue so they marched the Cavalry onto to the river hoping to hold out one more turn to use a "Mounted Charge". 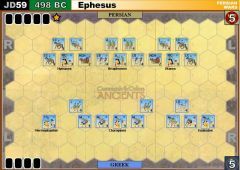 The Greek closed and finished off a damaged medium infantry for the victory. 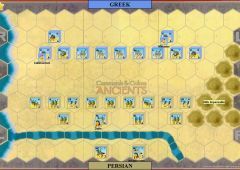 Lucky Roll of the game: A Greek Auxiliary Infantry took out a three block medium and its leader. 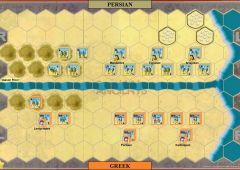 Bad move of the game: The Persian did not play "First Strike" against the above attack, especially bad because the Auxiliary was not supported.